Wholesale white hand towels for use in Salons, Gyms, Spas, Hotels and many more businesses. If you are looking for a medium size hand towel this will be the product to go with. Hand towels can set the tone in a washroom, spa or hotel. When you offer sumptuous, soft towels for people to dry with, you show your business is committed to the comfort of your guests. That’s the sort of message any company can get behind. Towel Super Center can supply you with the premium blended hand towels you need to help people dry their hands, wipe up messes, clean off sweat at the gym or even twist into fun decorations. With premium white hand towels, your business gets a high-quality product that won’t lose its shape after multiple washes. Our towels stay velvety to the touch, too, no matter how many times they’ve been used. We take pride in offering high-quality products your guests will appreciate and laud you for buying. Our 16-by-27-inch premium hand towels offer a unique blend of cotton and polyester, mixing natural fabrics with manmade textiles seamlessly. This allows you to get the best of all worlds when you order white hand towels for your commercial establishment or residence. What can you expect from these wholesale hand towels? Performance. You deserve to have towels that can hold up to normal wear and tear, and these definitely deliver. You can count on them week after week, eliminating the need to constantly reorder hand towels. Thirstiness. Cotton's natural absorbency shines through when you count on wholesale blended hand towels. When your towels come in contact with moisture, they drink it up. This enables you to use fewer hand towels to get jobs finished fast. Quick-Drying. Why spend more than you have to in order to get your bulk hand towels dry and ready to reuse? Cotton and polyester are materials that are known to dry rapidly. Spend less time using your dryer and more time impressing your customers or guests. Stain Resistant. With a little help from you in the form of pretreatment sprays and immediate laundering, your white hand towels will resist holding on to ordinary stains and spotting. Give your clients or visitors a fresh, clean-looking hand towel every time. Looking for other types of towels to coordinate with your blended premium hand towels? Towel Super Center has every type of towel you can imagine, perfect for all your needs. You might worry that our towels sit out of your price range because they’re so durable. But thanks to our wholesale pricing, you’ll find these products unexpectedly affordable. The more you buy, the more you save, and you can pass that affordability on to your own guests. Get hand towels you’ll be proud to display in your washroom, guest rooms or spa. When you invest in our products, you’ll save money down the line. 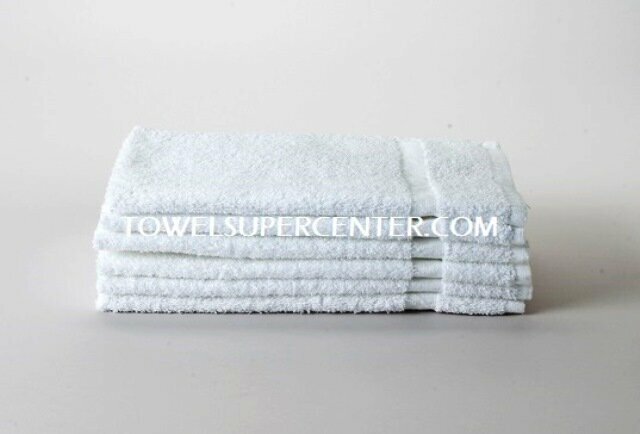 Contact Towel Super Center today to discuss which towels will best fit your needs.